Our day started at 6am in the crystal twilight before winter’s dawn. Actually, it started at four because I woke up and was too nervously excited to sleep, so I cuddled my dog until 5:30 and then stumbled out to load the car and fetch my horse. And it wasn’t crystal twilight. It was pitch dark and freaking cold. Sometimes, poetry just fails. I tried, okay? Arwie was dead easy to catch, albeit a little shocked at the hour, and she didn’t have so much as a speck of dust on her at all (for which miracle I uttered a little prayer of thanks). She soon got over her sleepiness when she was presented with breakfast, which she gobbled with every sign of enjoyment while the other horses stared at her being jealous and nickering accusingly every time they caught my eye. Poor babies. I dusted her off, combed a few bits of hay out of her tail and put on her travelling kit before marching her up to the box with her haynet and grooming kit. After getting over a very daft spook at her back boots (in her defence, she’s only used to back bandages), she was perfect, walking along at my shoulder with her ears up, alert but relaxed. The box was ready with ramp down and all, so I walked her in circles beside it until she’d stopped blowing at this random big white thing. Then I approached the ramp. She walked up to it and stopped. I walked up to the top and tried to persuade her in, but she danced at the foot of it and said it was too scary, so I stepped down beside her, stood at her shoulder and encouraged her to step forward next to me. She hesitated for about one millisecond and then walked right up. Arwen is usually okay to load but needs a lunge rein put around her bum, so I was very pleased, and my dad was very displeased when he saw me backing her straight back down the ramp (she backs up like a lady, by the way, nice and slow and dead straight). Luckily, I made a circle and walked towards it and she again went straight up, no worries. Obviously travelling can’t be that bad if she boxes better every time. She started shivering a little as we put up the ramp and tied the breeching strap, but I fed her carrots and she started to pick at her hay. Without further ado, we set off. We stopped about half an hour down the road and I checked on her again; she was a little sweaty and wasn’t eating, but she’d stopped shivering and was standing calmly and looking out of the window. Last time she’d been dripping with sweat by this stage, so I was happy with her. We arrived at the venue very late. I’m ashamed to admit that I got mixed up with the starting times and thought my class started after 9:30; we got there at 8:30 to find that the 30cm was on the go and I was riding in the 50. And the classes were by no means huge. Arwen unloaded like a lady and was very calm. I walked her around a little and let her graze; she was slightly sweaty on her neck, but dried within a few minutes. Last time her day sheet had been sodden when we arrived, so there’s a definite improvement. As soon as Arwie was settled and we’d spied out the lay of the land, my family and I bustled to get her tack and my jodhs on and we set off for the warm-up ring. 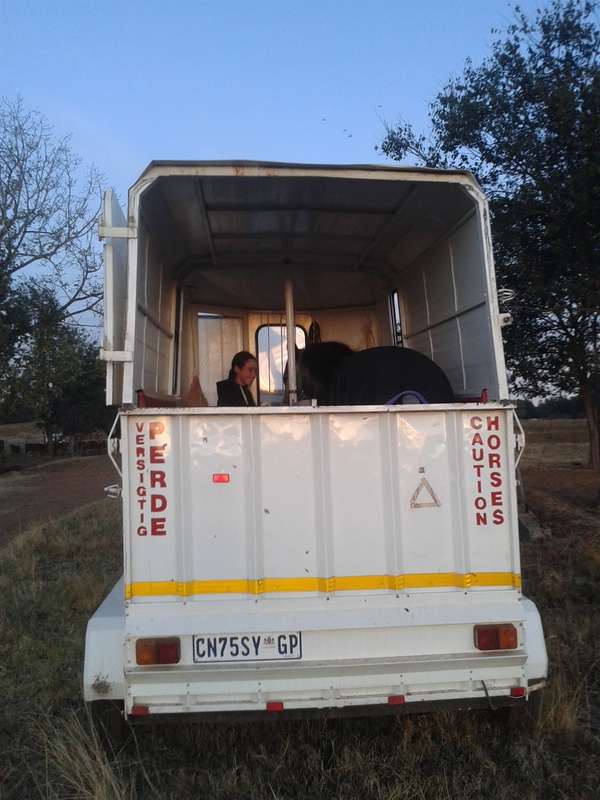 It was a 20 x 40m dressage arena without fencing and with about three people already in it, so I said a prayer that she wouldn’t kick anyone and had to be very wide awake. It was actually perfectly fine; the footing was a bit wet, which Arwen hated, but she soon got used to it (after shying at the scary dressage markers. Insert eyeroll here). She didn’t pull on my hands or whinny, but offered a few little bucks at the canter, which is normal for her in a warmup. To my dismay, our happy little warmup was then abruptly cut off by an arena hog. This was the first time I’d come across one, and I dearly hope I never have to meet another. A big lady on a big warmblood entered the tiny arena and started to canter around as if there weren’t four people already in it, with very little consideration for other riders. 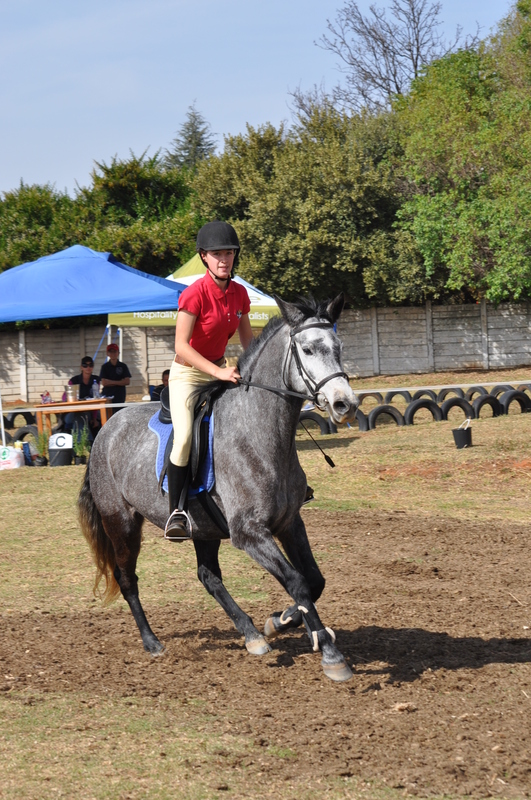 She hogged the track and ignored the left shoulder rule (despite the kids on ponies trotting around), with her instructor parked solidly in front of one of the warmup jumps. I was going around peacefully on the outside and she approached from in front; the left shoulder rule indicated that she should go on the inside. We were both in a canter, but I saw that her horse, though large and young, would comfortable be able to make the turn on the inside so I stuck to the track. So did she. So did I, not being in the mood to be bullied; Arwen pinned her ears flat and told the other horse in no uncertain terms that he was going to get a very big kick if he decided to play chicken with her. The big horse, most sensibly, veered off to the inside, clearing us by about six inches, and I had to give Arwen a sharp tap alongside the flank to stop her from making good on her threat. Drama aside, Arwen warmed up fine, didn’t hesitate at a single jump (but threw a few bucks after them). We headed off for the 50cm and had a great time watching all the little kids and ponies zip around. Then it was our turn. Arwen was nervous from the get-go and, I’ll admit, my head was definitely not in the game. She pretty much stopped at the first jump, but I gave her a kick and she popped over. Second jump was fine, then the sharp turn to the combination, then the fourth and fifth and sixth verticals without any trouble. The seventh vertical was an ominous-looking red object with what seemed like about a thousand poles and Arwen again had a nearly-stop which I kicked her through. She jumped the rusting number eight with an almost audible sigh of relief, was fine over jump nine and we gambled on a very close corner to jump ten – nobody else took it quite so tight, but I have faith in my ex-barrel-racer and she was perfect. Jump ten was a scary blue plank thing, and she was very looky, but okay. It was a quick but messy round, but good enough to get us into the jump-off. I don’t really know what was going wrong, in all honesty. She was spooky of the coloured poles, but she hadn’t been at her previous show. I wasn’t mentally where I should have been; my head was somewhere else entirely and maybe the rushed warmup had rattled us both, too. Whatever it was, I was riding like a chop and she was dead calm in the warmup and dead spooky in the show ring. We galloped into the warmup much too fast, scrambled over the first jump, ran out at the second (to the left! she drifts right… what on Earth?! ), almost ran out at the third but made it by the skin of our teeth, and then jumped the last few jumps perfectly. We could have won easily if we hadn’t had the run-out; she was lightning fast, and we took some close corners, as usual. The next class was the 80cm and I went into the warmup with those two run-outs in the back of my head. I had watched the 60cm and it had looked enormous, despite the fact that Arwen and I have been okay over almost twice that height at home. (Why is it that jumps always look a hundred times bigger at the shows?) There were only two riders in the 80cm, and I had the warmup ring all to myself, which was a wonderful pleasure. 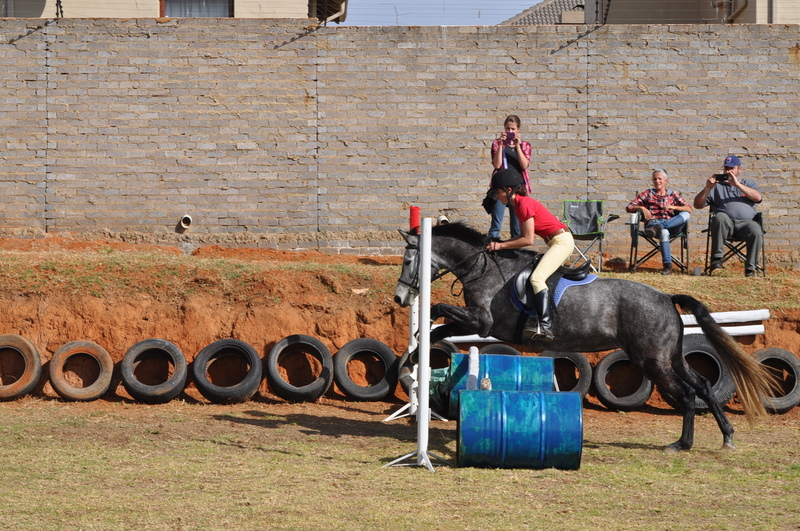 I put up the warmup jump to about 90cm and she jumped with no hesitation at all. In fact, she felt better than she’d felt warming up for the 50. “Finally! We mean business now!” I dared to hope, rode better, and she was fantastic. But when we got back up to the show ring to wait in line (where her muscles cooled off again… sighs) the jumps looked HUGE. Like, 1.50m+ huge. It was stupid. When I walked the course I measured them against myself just to make sure they really were 80cm, which of course they were, but they still looked massive with about a mountain’s worth of filler. Which, of course, they didn’t really, but nerves do funny things to a person. The rider before us had a messy but gutsy round on a young horse, earning him a few penalties, but I had a sinking feeling in my stomach and poor Arwen must have felt it. I was half on a different planet and half scared, so it was hardly any surprise when she had two stops at the first jump and another stop at the second for a disqualification. 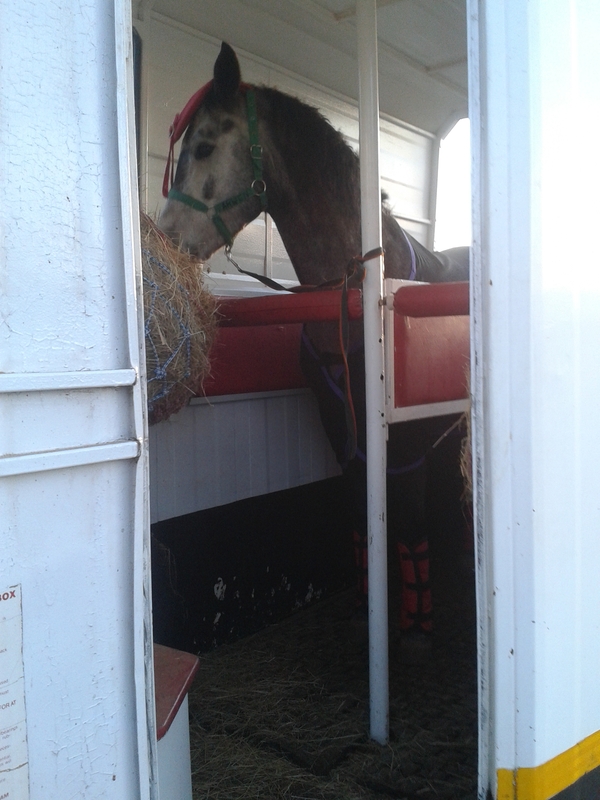 We jumped the second jump again on the way out (yay for training shows) and she was okay. I just shrugged and hoped for better luck next time. It was a bummer, and I can’t really think of anything specific that we got wrong. 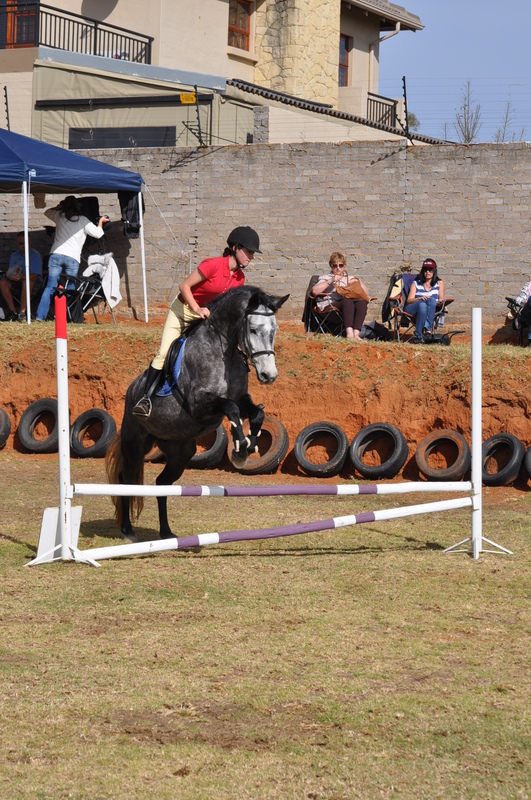 The course could have been a bit high for our second show, but she was jumping way bigger at home and had jumped very confidently at her last show – the run-out at the 50cm was very unlike her. 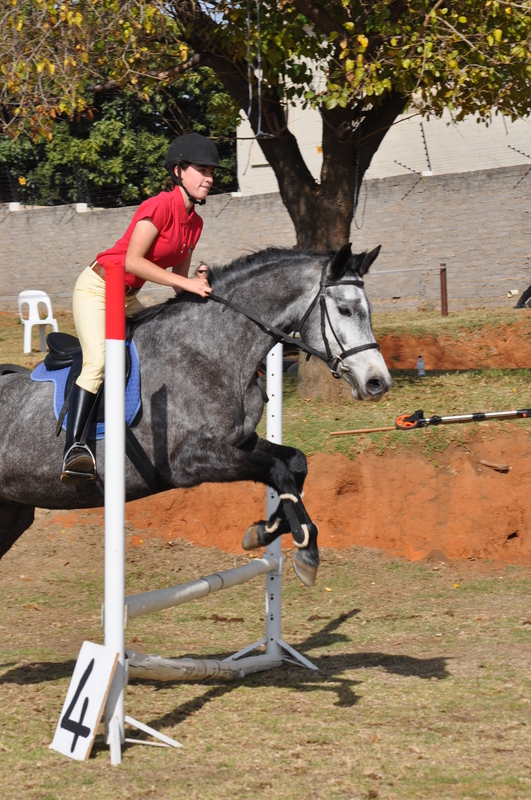 Maybe the filler rattled her and we need to practice scarier jumps – but I’d recently added some new filler to jumps at home and she hadn’t even thought about stopping at a 1.10m scary jump. I guess it was just one of those days. 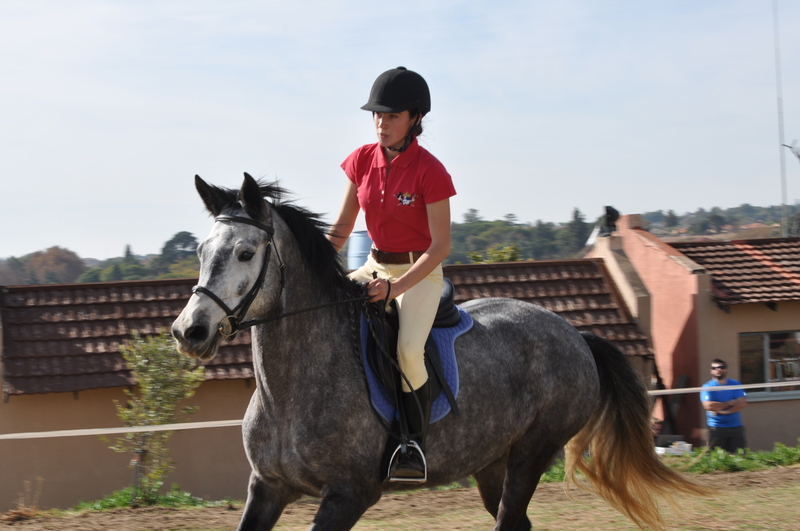 They happen in horse riding, and you just learn to get over them and try again. She was sound and sane and didn’t seem to have anything at all wrong with her, so I had no intentions at all of scratching from the dressage. In fact, she was getting into her usual Arwen show mood – focused and relaxed. I dared to hope that we might redeem ourselves. My horse, my God and me. Still in this together. Always. That last photo is absolutely wonderful, Firn. I do hope you and Arwen do well. I love it as well, Lyn – the photographer really did well to capture such a great moment. It might not be our most technically correct moment but her expression is perfect – she’s stressed out, but she has one ear forward on the job and one ear back on the rider. That’s my horse!